Oust the louse! The safe, natural and effective way to detect and remove head lice. 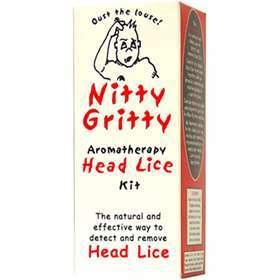 The Nitty Gritty Aromatherapy Head Lice Kit is a simple way to detect and remove head lice their eggs (nits). The kit consists of a double sided fine tooth comb, together with an intensive aromatherapy solution blended in a nut-free base. The Nitty Gritty Aromatherapy Head Lice Solution contains Neem and added wheatgerm to leave hair in shiny, tip top condition. No chemicals, organophosphates or unpleasant smells, just safe, natural ingredients! Unlike some other head lice treatments, Nitty Gritty Aromatherapy Head Lice Solution won't foam up, allowing you to see what needs removing. Apply to dry hair saturating the scalp and roots. Using the enclosed fine tooth comb or the Nitty Gritty NitFree Comb (sold separately), work right through until the hair is thoroughly moistened, removing any lice that have been caught in the comb. Leave on for at least three hours, combing frequently. In order to break the life cycle of the lice, it is very important to repeat this procedure after ten days. Fine plastic tooth comb (please note this is NOT the metal Nitty Gritty Comb). For best use, use in conjunction with the Nitty Gritty NitFree Comb and Nitty Gritty Head Lice Repellent. Aromatherapy oils of - Oils of: Vitis Vinisera, Triticum Vulgare, Azadirachta indica, Eucalyptus Radiata, Pelargonium Graveolens, Lavendula Angustifolium, Rosmarinus Officinalis, Melaleuca Alternifolia.